It’s our 6th anniversary! We started this initiative up as fierce,young pups in July 2012, and we’re still having a great time fighting the good fight with dexterity, community, and creative reasoning. Come celebrate with us by bringing in a bunch of broken stuff to fix! As always, the more the merrier, and drinks (alcoholic or otherwise) and snacks are most welcome. See y’all there. 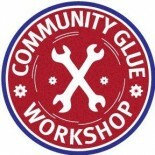 This entry was posted on June 25, 2018 by communityglueworkshop. Next Repair Clinic is Sunday, March 17th! Happy 2019, you lovely humans, you! Our next repair clinic is Sunday, January 20th. Final repair clinic of 2018: Sunday, December 9th! Community Glue at The Plant on November 3rd!